PLEASE NOTE: Our office location is incorrectly mapped on Mapquest and Google Maps. We are trying to resolve this issue. In the meantime, please use our directions! Go south on US 59, exit Grand Parkway (99), turn right on Grand Parkway, pass HEB center, go to the first light (River Park Dr.). We will be on your left behind the Shell gas station. Go north on US 59, exit Crabb River Rd. (99), turn left under the bridge, pass HEB center, go to the first light (River Park Dr.). We will be on your left behind the Shell gas station. 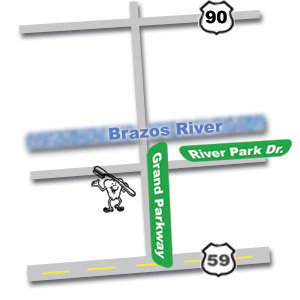 Exit Grand Parkway (99), go south on Grand Parkway, pass New Territory and the bridge over the Brazos River. We are at the next light, River Park Dr., behind the Shell gas station to your right.